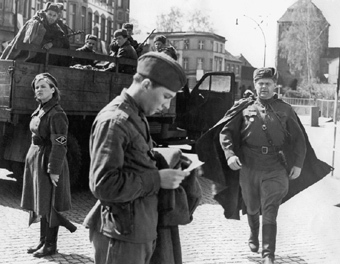 April 1945: Gregor Hecker returns to Germany as a soldier in the Red Army. Born in Cologne, he grew up in Moscow after his parents were forced to flee the Nazi dictatorship. He is now nineteen and already an officer. One of his most important responsibilities in the last weeks of the war is to call on the German soldiers to capitulate instead of continuing their useless fight on the front lines. Gregor is made town commander of Bernau near Berlin. When he has to set up quarters for his staff, he comes across a German military unit that is not even aware of the Red Army's arrival. He is present when the Sachsenhausen concentration camp is liberated and meets an intellectual who seeks to play down German fascism as a harmless historical fact. He is ordered off to the citadel in Spandau on a special mission as an interpreter at the negotiations leading to the German capitulation. The German officers do not agree to a surrender until the very last minute and some continue to exhort the others to "hold on" and demand that the emissaries be shot. Later, he takes part in a Red Army celebration to which liberated German prisoners have been invited. Two days later, Gregor's efforts to persuade German soldiers to surrender appear to bear fruit for the first time. Konrad Wolf was born in Hechingen in 1925 and died in Berlin in 1982. In 1933, his family emigrated to the Soviet Union. At the age of 18, he joined the Red Army and came to Germany as a lieutenant in 1945. He studied Directing at the Moscow Film School in 1949 and worked as an assistant director to Kurt Maetzig at the DEFA Studios in 1953. His first feature film was Einmal ist keinmal (1955). From 1965, Wolf was president of the East German Academy of Arts. His major films include: Genesung (1956), Lissy (1957), Sun Seekers (Sonnensucher, 1958), Stars (Sterne, 1959), The Divided Sky (Der geteilte Himmel, 1964), I Was Nineteen (Ich war 19, 1967), The Naked Man in the Stadium (Der nackte Mann auf dem Sportplatz, 1974), and Mama, I'm Alive (Mama, ich lebe, 1976).